It’s Greek to Me: Greek Layer Dip | This RD Eats! 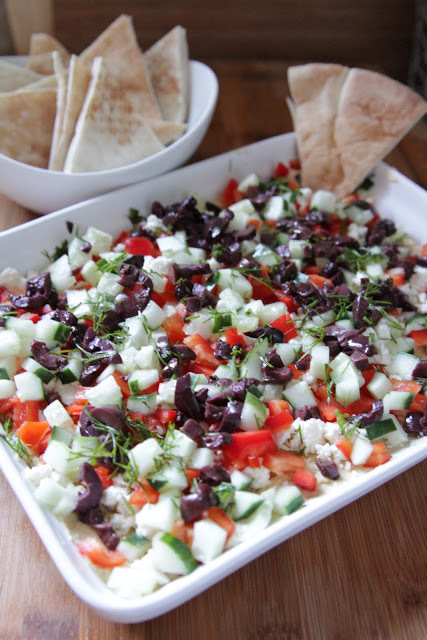 One of my favorite dishes to bring to a party or get-together is my Greek Layer Dip. It has so much going on (creamy, salty, juicy, crunchy, crispy and fresh). It is a flavor explosion. You can throw it together (literally, you just sprinkle the ingredients) ahead of time and take it out of the fridge before serving. The ingredients are simple and can be modified to your liking. Just a forewarning, once you start snacking, it is hard to stop. HIGHLY ADDICTIVE! Spread hummus on a 10 inch platter or decorative plate. Sprinkle cucumber, tomato, olives, feta and green onions over hummus. Eat with sliced vegetables, tortilla chips or pita chips. *Note, this dip is great to make ahead. Prepare as above, cover and refrigerate until serving. This entry was posted in Recipes and tagged appetizer, Dip Recipe, Dips, Greek, Greek Dip, Greek Layer Dip, Holiday Appetizer, recipe. Bookmark the permalink. This would be a great dip to have for the Thanksgiving crowd! Looks and sounds YUMMY! This dip looks so tasty and easy to do! Fantastic recipe! Thanks. This recipe is extremely easy. My kiddos even help assemble it. Enjoy!